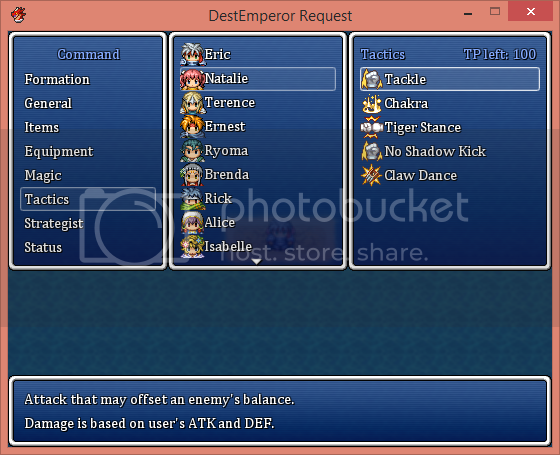 As of now, a battle and menu system that resembles DoaE exists for VX Ace. An algorithm for rations use exists and actively works and can be edited at will. Unified party level exists but can be disabled for individual generals to gain exp separately. Damage algorithm exists and can be changed at will. I plan to release a DoaE style VX Ace starter pack in the coming months. I still need things to make this happen. There is where the interested come in. 1. I need the NES sprites in VX Ace characacter sheet format. 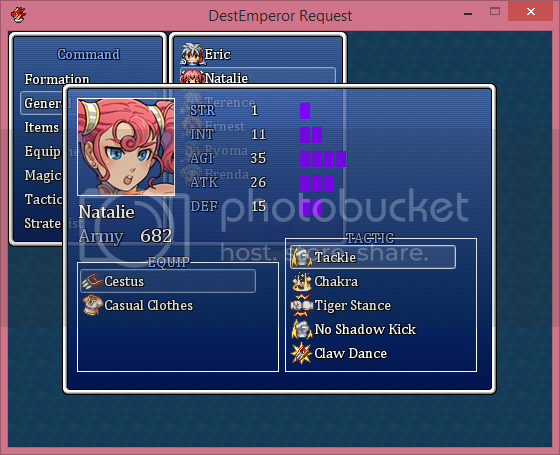 These include DoaE 1 and 2 character sprites. 2. I need tile sets for DoaE 1 and 2. 3. I need looped music from DoaE 1 and 2, OOG format. 4. I need the DoAE 2 faces in VX ace format. I already did the DoaE1 faces and assigned them all to generals. Once I have these things, I'll release a pack and the general community can freely make games with far less limitations than rom hacking. Want to add Suikoden runes? There's a script for that. Want materia? Why not? Alchemy. Sure. Different party limits? Okay. I can rip the sprites myself and arrange them, however; I'd rather use my time to flesh out all of the buildings, shops, ect for people to use as a template for DoaE. I'd rather set up battles at gates and towns for the starter pack that the user can study, then freely delete. I'd also like to take the NES sprites when finished, and convert them with NES recolor additions for variety, and then make SNEs quality sprites out of them with a wider color palette, highlights, shading, and outlines. That's a time consuming process that will be on me when the time comes. Please, if you're able, help make this a thing. The hard parts already done thanks to a Ruby coder being paid to craft the battle system and menu for me, and I'm going to allow free use of it! I'd be great to see a DoaE moder like Sonic Penguin take interest in this user friendly system and lend his artistic portrait talents to expanding resources. Just saying. Pictures are from during development, too lazy to take finished ones at the moment. The windows they display can be any color, solid, or translucent. Text can be any color as well. Last edited by sjmorgan on Sat Oct 03, 2015 5:10 am, edited 2 times in total. Not sure on two post in a row rules, someone correct me if I dropped the ball here. 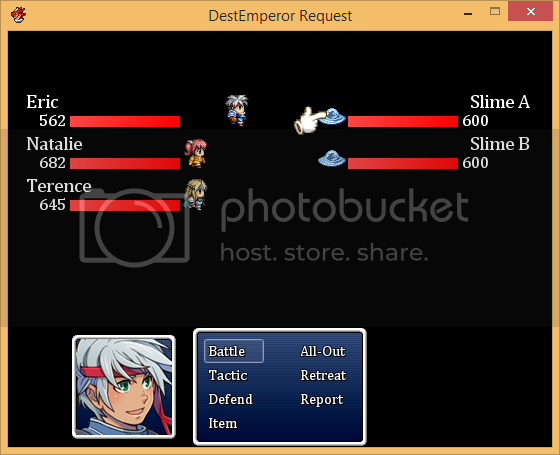 Updates to the RPG Maker VX Ace DoaE starter project! Through browsing the internet and Gamefaqs, I've learned the damage algorithm was more complicated than I originally knew. A user name MeteorStrike had a real and accurate break down of it all. Discovering that the A.C damage rating of weapons is entirely fake and trivial, a trick number with the real one hidden... the battle system had to be updated. Now real weapon attack power is hidden from everyone but the developer of said game in the system, and you can assign a simple fake attack number easily! It's hidden by using default attack power as the dummy for the general screen, and using a note tag on every weapon assigning the actual attack power for the formulas. A new parameter has also been created and inserted into the damage formula to automatically change STR multiplication from 1-5 depending on current amount of Troops (HP) that you have as any given attack is made! I'm proud to say damage is 100% authentic now, excluding the invisible bonuses provided to generals by being inside of fortresses or gates. I still don't know those exact formulas, but when I learn them... states will be created that can be auto applied round 0 of boss battles to generals to give them the appropriate bonuses when necessary. As a dev using this kit, you'll be able to change HP bars based on stepping on any given tile (making it a one time or every time change.) This change two separate color tones that you control, and you can change the max troops (HP) necessary for the new bar to max! You could make the bars change with Gullwing use based on town selected, and change very time you enter a new region, or just update the bars and have them never look back. Food algorithm runs through a region tile script where you can change and assign the algorithm based on individual region tiles without creating frame lag. This means you can make it every step, every few steps, different food consumption based on different current troop totals or terrain you step on. I've be assigning a default food algorithm that most people won't want or need to change, but you can change it! I also need not remind people that while we can create DoaE style games, clones, custom stories, we can also create games from any era of history, or fantasy games that have the DoaE feel! This starter pack is going to change the game some for anyone willing to develop in RPG Maker VX Ace!!!!! 1. The system to add or remove recruited generals from the party has been added! 2. Unified leveling is perfect. 3.The last hurdle is to be able to assign custom HP tags to allied generals with over 9999 HP. (TROOPS) Also need custom level up HP tables for Tiger type characters to break 9999 as it's the makers friendly HP limit. Enemies don't share that issue. I've realized use of this system will involve a few things that won't feel familiar or natural in set up for users. I'll be included instructions that are sectioned for each system within the DoaE Starter kit. They're all easy if explained once. Hell, I didn't develop most the custom systems but learned them in 2-5 minutes each. 1. How and why damage is 100% accurate. How to set up your own weapons! 2. Assigning STR to allies and enemies. 3. Breaking the HP TROOP limit if you need to. 4. Altering the food algorithm if you want to. 5. How to make a recruitable general and to decide when he is and is not recruitable. 6. How to make a boss fight to gain access to a town. 7. How to set up adding and removing generals you recruit. 8. How to set up Tactics. 9. How to un unify levels and exp if you want. By default, they are unified and authentic. 10. For basic help with the maker itself and it's non custom functions, check the built in help or vxace forums. Doing one more custom tweaks, then only sprite ripping is stopping the release. The remaining tweak is automatically associating INT with success of a Tactic. I'll look it over in a few minutes. 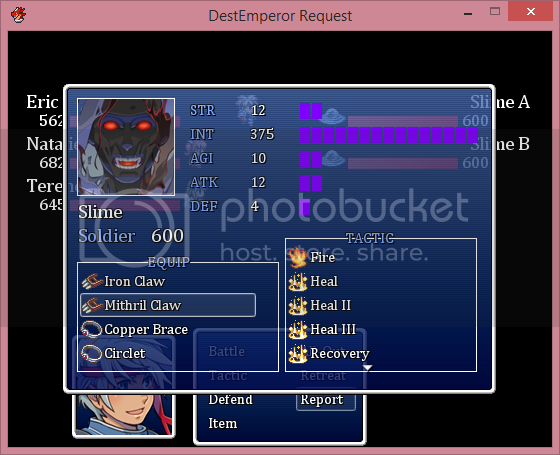 This systems already completely done, I just need sprites. Edit. I checked the file and unfortunately it doesn't have any sprites that can help the cause. It only has Liu Bei, Guan Yu and Zhang Fei. I already have 100% of the DoaE 1 faces converted, and it had like 30% of those that I already have. I don't own RPG Maker VX to open the actual game, however; the scripting for the VX Ace version is already finished save for the custom HP script being made as I type this. What I need to make this a reality and complete is all of the DoaE 1 walking graphic generals ripped, or to rip them myself in time. DoaE 2 face sets and DoaE 2 walking sprites are something I'd like to add, but I'm willing to release it without them and tackle them separately as an add on. I also need better quality music files than the ones I've found so far. I've already posted what I plan to do in detail, and that's already a part of it. The custom scripting for every aspect of DoaE was far more important than the graphics though. This VX Ace script set emulates everything needed and lets the user change it. What I want to leave the user with is a starter kit with graphics, a complete data base, and the first area of the original map fully working from start to end of the Yellow Scarves. The player can see how it works, delete it or build on it using the scripts. A starter kit should have everything they need to make a project. The tester game I'm making is going to use more advanced sprites and have a very different theme than DoaE. A couple years back I tried recreating DOAE in RMVX, but my knowledge of ruby is so-so at best, so I abandoned it. Hopefully, you'll have better luck than I did. 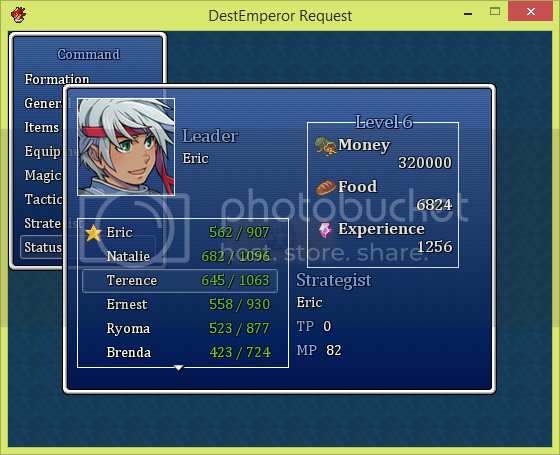 Also, I recommend using RoTK11 portraits; since we're not using an NES engine, there's no reason to use limited graphics. use the NES sprites and portraits! The starter kit is going to have the NES portraits, but nothing will stop any user from simply using any other portraits they choose. Also won't need luck for recreating the engine, that parts completely done. It's only a matter of sprites and minor stuff at this point. This starter kit even does things like list increased soldier totals only if there is an increase, tactics learned and TP increases for level ups. It's a complete system, but I will not release it without a starter sprite set.